With help from our TG Top 50 Coaches, here are 12 things you can improve easily in 2018 to help with you consistency and get your handicap down. If you improve just one thing this year, make it one of these. Lower scores need not mean blistered hands on the range. Here are 12 things you can improve easily, by our Top 50 teachers. 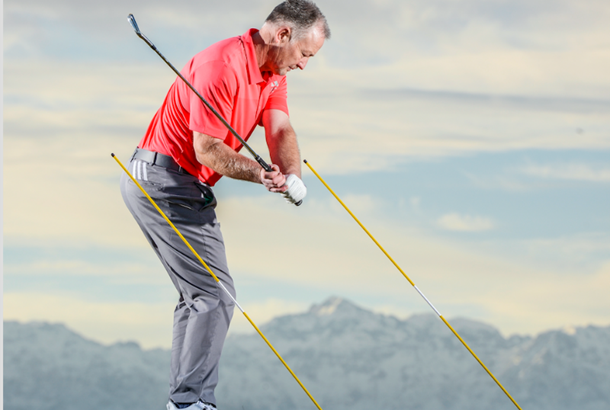 Your set-up basics of grip, aim, stance and posture all dictate the quality of the action that follows; it's no coincidence that the one common denominator for all elite players is an excellent address position. And the great thing is that you don't need Rory's skill or athletic ability to set up like him! All it takes is a commitment to work with your coach on creating your best swing platform possible. Make this your priority in 2018. TV commentators, and the world's leading players, often focus on the massive distance golfers now hit the ball. But believe me, most amateur golfers could reduce their handicap without hitting it one yard further. Understanding the relationship of the clubface to the swing path and creating a more centred strike would develop more ball control and see you hit more fairways and greens. Your high scores are generally a result of hitting the ball o ine rather than not far enough. And the bonus is the better your swing path becomes, the further you'll hit it as a by-product. Hitting greens with a wedge is well within the compass of most club players and makes a massive difference on the scorecard; yet too many greens get missed, mostly because of sending the ball the wrong distance. So practise hitting wedge shots various distances by changing length of swing only; focus on keeping a constant pace to your swing, and a constant acceleration rather than a sudden rush at the ball. 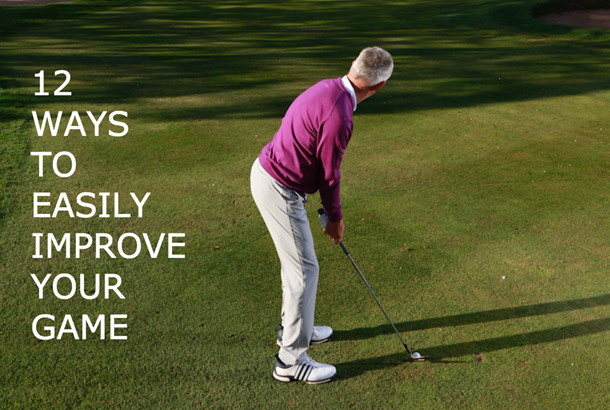 Your distance control will dramatically improve. For 2018, work on your distance control around the green including putting... to do this I would prioritise the King (weight/distance) over the Queen (direction). Both are important but the King should be respected more. And remember, only use loft when necessary. All too often I see golfers of all standards struggling on the greens, especially in competitions or pressure situations. This is because they spend a disproportionate amount of time and attention trying to get the line spot-on at the expense of getting the pace right. Pace determines line; in fact I would go so far as to say the line does not or cannot exist without the appropriate or relevant pace. 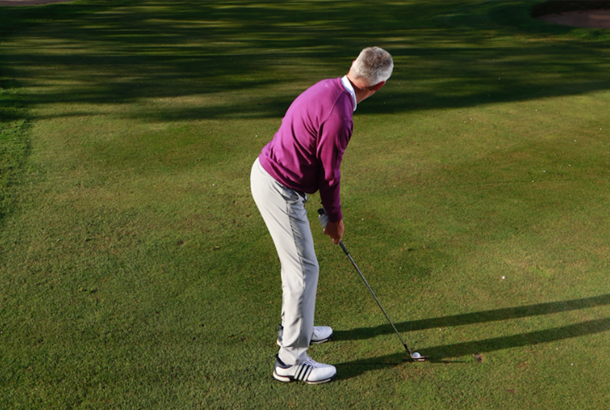 Pay more focused attention to pace and you will hole more putts, shoot lower scores and have more fun. Get a better understanding of what your body is physically capable of doing and improve your swing based on those facts. Stop trying to compare yourself to tour players and build your own swing, which will always be the most e ective. When you understand what limitations could be holding you back, you can then choose to work on them or work within them; either way, this knowledge can really separate you from the rest. Learn what works best for you, and play your best golf based on that. Eat a proper, nutritious breakfast combining protein and slow-release carbs prior to playing rather than running onto the tee with nothing or at best a bacon roll. Then hydrate and continue to 'graze' throughout the round. Take uid (preferably something isotonic) and snacks like fruit/nuts etc regularly rather than eating a chocolate bar and having a drink at the turn. 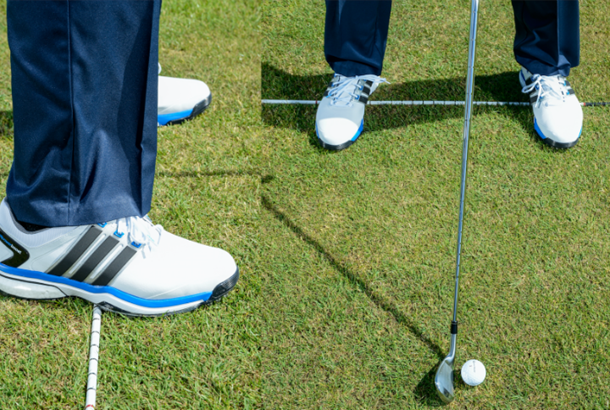 Place an alignment stick or old shaft parallel to your ball-target target line and stand on it, making sure it runs under the centre of both feet. Address a ball with a mid/short iron and check your balance at set-up; the stick will tell you if you are too much in the toes or heels. From here hit 10 balls, again focusing on your balance; the stick reveals any toe/heel tendencies and really highlights where your balance should be. Finally hit 10 normal shots without the stick to feel the improvement in your balance. Lots of my students have improved distance and accuracy through this drill. If you improve your pitching, your scoring will drop into a new level for 2018. Think of all the opportunities you have on short par 4s and lay-up par 5s! To do this, master three length of swings. Keep your rhythm the same and work the clock face arm swing, perfect your own 09:30, 10:00 and 10:30 swing to control the distance. Measure what distance they go and repeat. Repeat a lot! When you add in a gap wedge and a sand wedge you now have nine di erent distances you can hit your wedges with deadly accuracy. 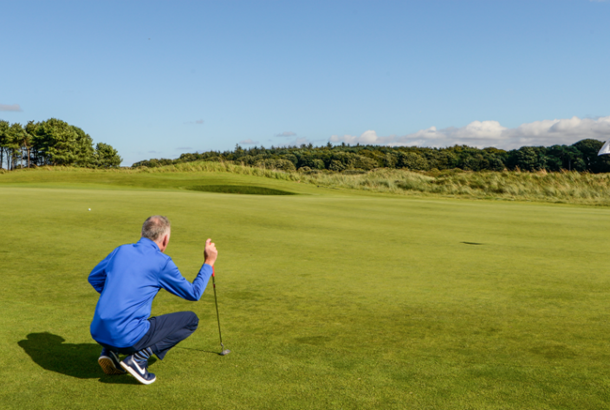 Also, head out to your local par 3 course every couple of weeks – and watch how sharp your game gets. Most golfers focus on technique to improve, but the body moves the club! Want to hit if further? Get faster and get stronger. The perfect role model here is Justin Thomas, who attributed his 2017 US PGA win to improved tness. Look into HIIT (High Intensity Interval Training) classes; they are a great way to improve your speed and strength, So, call up the local gym and make 2018 the year you improve your golf... and your health!